Here is the history on Cooper, a Metal horse temperament, from his owner, Pat. She was so frustrated with Cooper’s aggressive behavior. 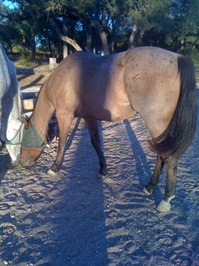 Cooper is a 5 year old Quarterhorse gelding that stands 16 hands. He has been easy-going and calm since he has been a foal. When in the pasture with other horses, he has always been ‘the low man on the totem pole’. When trail riding, he was complacent and happy to be the last horse. He has always seemed to handle change easily. In March, things started to change. I first noticed when leading him, that he would take little nips at me when I wasn’t watching. The next thing that changed, when trail riding with his dam (Kate) and my best friend Rita, he started coming on to Kate and pinning his ears to make her move away. In the pasture, he started being dominant over the other horses. When riding him at the Buck Brannaman clinic in March, he turned around and bit my foot for no apparent reason. Rita and I have always let our horses loose after a trail ride to eat alfalfa next to each other or from the same pile of hay. In early April, while eating the alfalfa with Kate, Cooper bared his teeth, pinned his ears, and attacked Kate. She spun and moved away. He attacked her again a few minutes later, and I flagged him and sent him away to go eat grass. I came on April 16th to work on Cooper. I was also baffled by his actions as Cooper had always been such an easy going kind of guy. As a Metal horse temperament, Cooper did have some problems with his immune system. He had been treated twice for EPM using Karbo pellets and Epic solution. Although Cooper had responded well to treatment for EPM and was not currently showing any clinical signs of illness I wondered if his Metal element was weakened from the repeated infections. Based on the Five Element control cycle the Metal element has a controlling effect on the Wood element. When the Wood element is not properly controlled, the horse can become more unruly and angry since anger is the emotion associated with Wood. With this in mind I chose several acupressure points to strengthen the Metal element(Lung 9) and sedate the Wood element(Liver 3). Conception vessel 17 was chosen to disperse stagnant Qi. After Dr. Madalyn Ward worked on Cooper Tuesday, April 16th, things started to go back to normal. On trail rides, he did not care what horse was in front or behind him, but happy to be there and interested in the trail. In the pasture, Cooper is once again yielding to the older geldings. Kate and Cooper can now eat the same flake of alfalfa and he shows no signs of aggression towards her. After this last adjustment from Dr. Madalyn Ward, Cooper has stopped tripping, and has become a partner with me while riding him. Before this last adjustment, it was a day-to-day struggle for him to keep focused and respond to what I would be asking. His concentration is consistent, his personality is delightful, and he has a sense of humor. He and I have become partners when riding together, doing obstacles with clarity and enthusiasm, At this point of Cooper’s and my relationship, I feel we are on the right path to understanding each other and having fun! Knowing your horse’s Five Element horse temperament can help you recognize behavior that is not a match for that temperament. When you realize your horse is behaving in a certain way because he is out of balance then you can take steps to bring him back into balance. Had Cooper not responded to the acupressure treatment we would have looked at adding some nutritional support such as Citrus C/Q to support the Metal element and milk thistle seeds to help calm the liver. For more information on Five Element typing please check out our book, Horse Harmony, our Five Element typing e book and our online certification course. For more information about feeding based on horse temperament type check out The Feeding Guide.